Wine on tap is an increasingly popular trend. Perlick is leading the way with its WINEcertified kit and direct dispensers to make sure that every glass of wine that gets poured from a tap tastes the way it should. Three things that ruin any bottle of wine are inconsistent temperature, exposure to light and oxidation. Perlick has created WINEcertified, which is its guarantee that all Perlick products and their components are manufactured to properly store and dispense wine, reducing the wine’s exposure to any of these threats. The Perlick WINEcertified Dispensing Kit includes five wine-specific features that are common among Perlick’s wine dispensing products. It features a faucet, shank, union and keg coupler all made of Stainless Steel. The kit also includes flavor-lock tubing that specifically protects against allowing oxygen to come into contact with the wine. The kit comes with four options for dispensing heads. The 2-faucet Draft Arm, 5-faucet Tee Tower, 1-faucet Lucky and 3-faucet Panther. 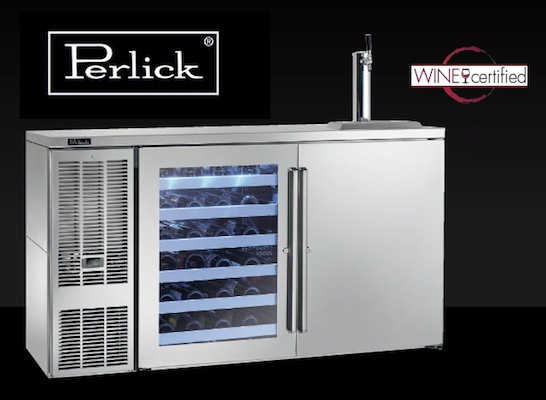 To find out more about Perlick’s direct draw wine dispensers, wine storage and WINEcertified dispensing kit, to learn more click here to visit their website.